Well, it’s official. May 18 is the expected date of the Federal Election, a day emboldened by the official squeal of Scott Morrison’s official tyres. However, it is the machinations of said move that is certainly worth discussing, as it highlights something that may be important for those still undecided: character. Now, the way that an election should be called should not be newsworthy, as you just drive to the Governor-General’s house to ask for permission to fire up the barbecues nationwide. We’re publishing this piece an hour late, and the news has dried considerably, as Morrison made the trip at 7 am. 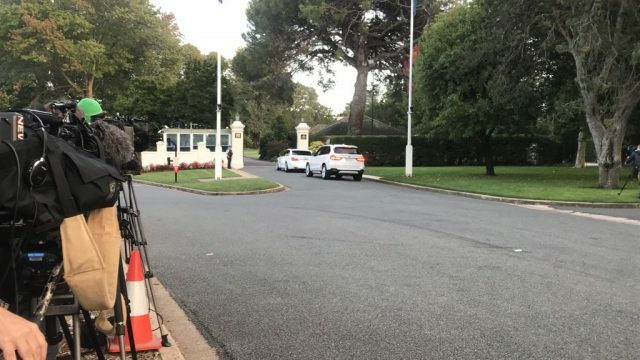 I realise that he’s the highest “elected” official in the land, but if we are to make it relatable, and put ourselves in Peter Cosgrove’s shoes, having to open the door before breakfast, not least on a chilly Canberra morning of eight degrees, is a bit much. Especially as the meeting lasted barely ten minutes. Maybe Scott had something on later, maybe he didn’t. But a meeting of eight minutes can surely be shoehorned in, or could at least wait until Cossie has had brekkie. For those playing at home, the man he replaced, Malcolm Turnbull, made the voyage at 12:30 pm. My point is that we all know the type. Everyone in their neighbourhood has that one person. The one who starts mowing at a godawful hour, or who loudly takes their bins out at 5 am, or who ‘warms up’ their beloved Statesman prior to breakfast on a Sunday. You don’t enter into their thought processes. Maybe you should have got up earlier. The horror of this person, is that it could be anyone. You don’t really know until you’ve moved in, until it is too late.